This entry was posted on Tuesday, December 5th, 2017 at 10:30 pm	and is filed under tutorials. You can follow any responses to this entry through the RSS 2.0 feed. You can skip to the end and leave a response. Pinging is currently not allowed. Wrong and wrong. 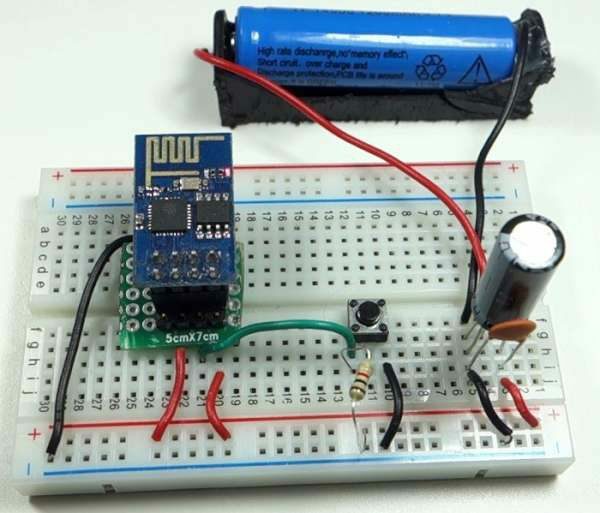 One: 100nF at the LDO output is unnecessary, or should be near the ESP8266 module. MCP1700 datasheet recommends 1uF, what’s the author putting a 100nF ceramic cap at the LDO Vout? In the bad old days of uncompensated LDOs (y’know, those that can’t use low ESR caps), this might cause ringing or worse. He should read section 3.3. page 10 of the DS. Two: 1000uF at the LDO output is nuts. Does he think he is still making a bridge rectifier circuit? What do you need 1000uF for? Just stick to 1uF! And giving advice to makers with his ebook. So his tech reviewer has utterly, irretrievably, irrevocably, failed. Agree, so okay, I guess he must have learned from somewhere. 100nF and 1000uF is so far apart, that was jarring; it’s more magic incantation than engineering. I don’t think I fancy 1000uF solutions *cough* band-aids. For MC34063 I understand, but for ESP8266 I’d help it deal with transients, while voltage sagging is more a power supply deficiency. According to its schematics, ESP-01 already has a 100nF / 10uF combo. For reference, SparkFun’s ESP8266 Thing uses 2.2uF at the LDO Vout, and a 10uF ceramic tank for the ESP8266. NodeMCU schematics show a 100uF, a bigger tank, tantalum. From its DS, MCP1700 can clear 100mA load transients under 100usec. I’d rather pick a Li-ion cell with enough current capability than use 1000uF caps. Let’s try a back-of-envelope calc balancing energies. From MCP1700 datasheet, there are graphs for a 200mA load step. Estimate the energy shortfall as 12uJ. Say we want to fill half of that (the transient minimum of 0.5V is very brief.) What’s a 6uJ loss to a 10uF cap at 3.3V? It would end up 3.1V, still good. Assuming a good power supply, MCP1700 will probably work fine with ESP8266 using a 10uF ceramic cap as an energy tank. For a battery, NodeMCU’s bigger 100uF cap sounds better, assuming the battery has a low-enough impedance. We really need that 10uF ceramic cap for the RF bursts. So there is a 70mA load step for chip operation, and maybe 150mA bursts on the RF side. A 1000uF cap does not solve the load step or the bursts. If an ESP8266 project really needed 1000uF to combat voltage sagging, then maybe we are trying to fix the wrong problem. Most LDO datasheets do not disclose how the opamp loop is compensated. But I’ve seen older Micrel DS with detailed info, phase plots, discussions of phase margins and compensation methods, capacitance/ESR graphs with stable region marked. Others, they are tight-lipped, usually guidelines only. What are the minimums? What are the maximums? And will unwanted transient power supply behaviour mess up your project? Of course, the thing might just work fine. But is it recommended practice? Nope. Somewhere down the line, someone who relied on the above as ‘good practice’ might just run into some ringing or oscillation problems in a future project. IMHO, it is prudent to stick to datasheet recommendations, unless you know just as much about opamp loop compensation as the LDO designers.